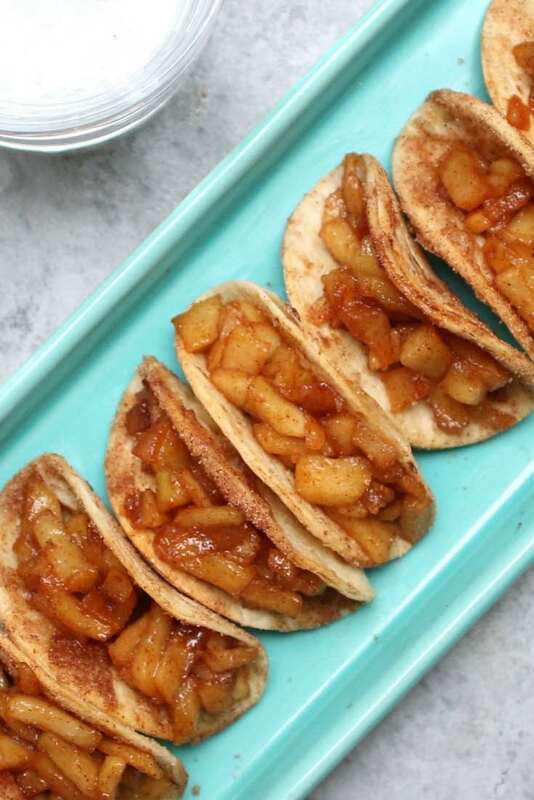 OMG whenever we get crazy apple pie cravings, we know it’s time to make Apple Pie Tacos again. They only take 15 minutes to make, and deliver mouthwatering apple pie flavor in each bite! This recipe includes a homemade apple filling that’s easy to make. You can also use canned filling if you prefer to save time. Because they’re baked instead of fried, they’re quicker and healthier to make than deep fried versions. 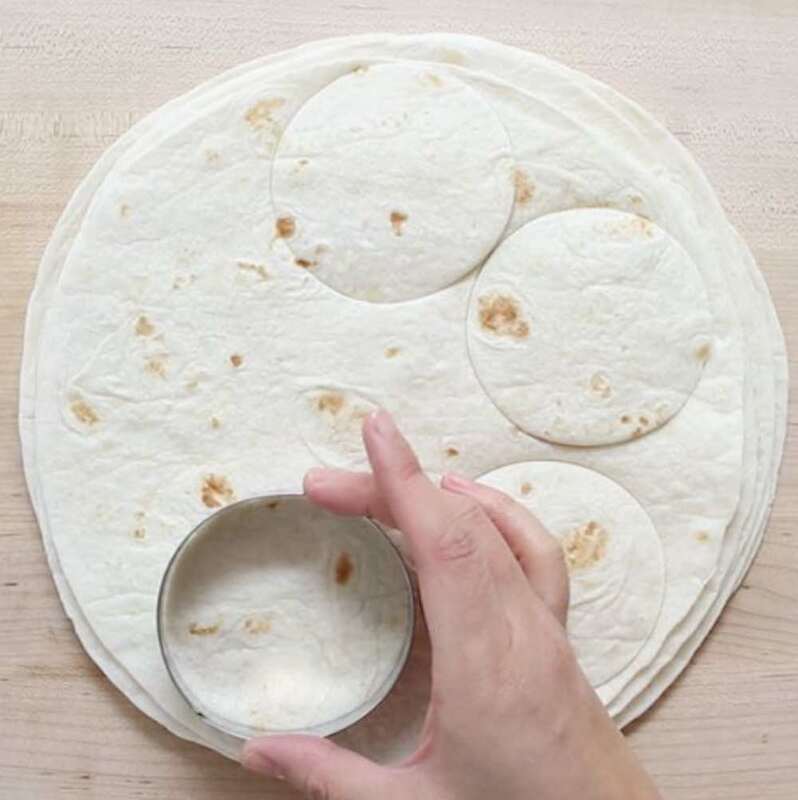 To make the circles out of the tortillas, grab a large circular cookie cutter and cut circles out of each tortilla. To save time, stack the tortillas in threes. The next step is to add some melted butter, cinnamon and sugar to coat the tortilla pieces. Probably the most fun is making the taco shapes in an upside-down muffin pan. A great activity for little helpers if you have kids around too. The tortilla pieces fit neatly in between the muffin cups to create the perfect taco shape, and … Voilà – you get 24 tacos from a 12-cup muffin pan! 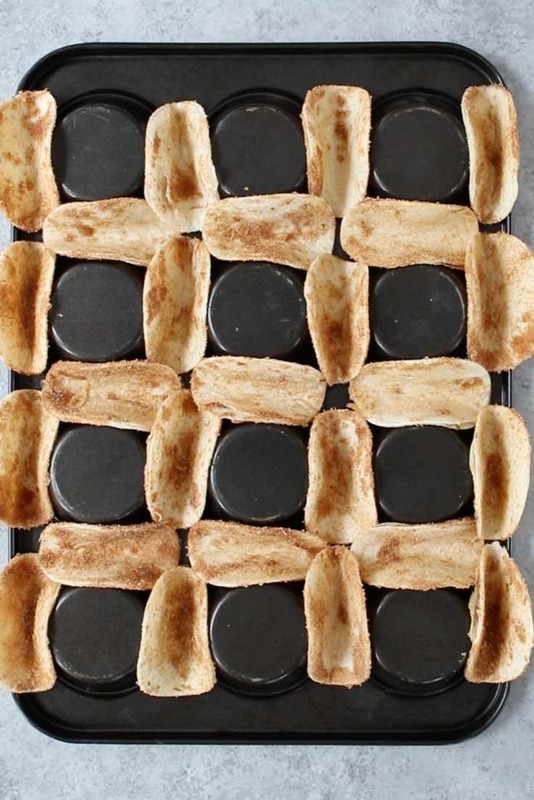 Pop them in the oven for 6 minutes and the cinnamon sugar caramelizes as they bake for an totes irresistible flavor. For the apple filling, just saute up some chopped apples with butter, cinnamon and sugar in a frying pan. If you want a shortcut, canned apple pie filling will work just fine. Then spoon the filling into the tacos to assemble. For serving it’s best to put the tacos on a rectangular plate side-by-side to help them sit upright. You can then drizzle the optional caramel sauce on the serving plate and top with whipped cream. Dee-lish! 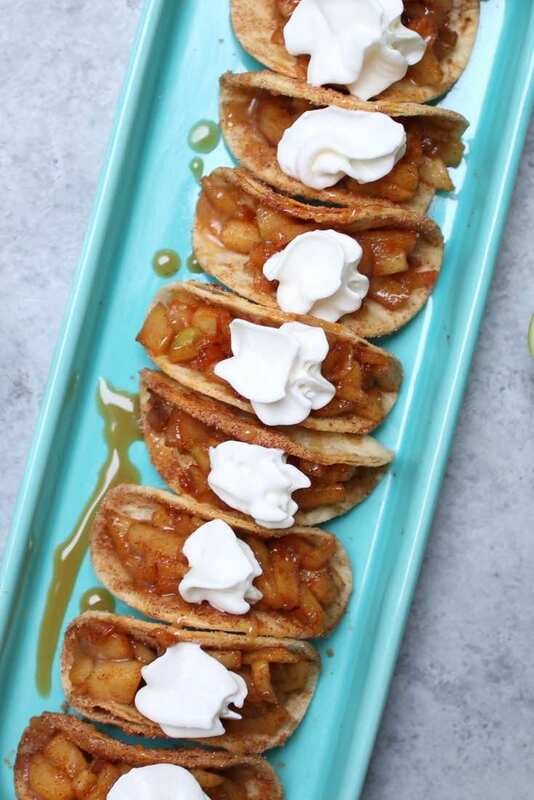 Delicious cinnamon sugary apple filling in a crispy and sweet taco, drizzled with caramel sauce, and then topped with whipped cream! Preheat oven to 400F degrees. Set aside a 12-cup muffin pan. Cut 4-5 circles from each tortilla using a circular cookie cutter until you have ~25 total. Place the piece into a large mixing bowl and add 2 tbsp melted butter, 1/4 cup sugar and 1 tsp cinnamon. Toss until coated. Flip the muffin tin upside down. Place the tortilla pieces in between muffin cups according to the video. Bake 6 minutes. Meanwhile, mix the chopped apples with lemon juice and the remaining sugar and cinnamon. Saute in a frying pan over medium heat with the remaining butter until soft. Remove tacos from oven and spoon apple mixture into them. Then top with caramel sauce and whipped cream. Serve and enjoy! Note: Canned apple pie filling may be substituted for the sauted apple mixture. 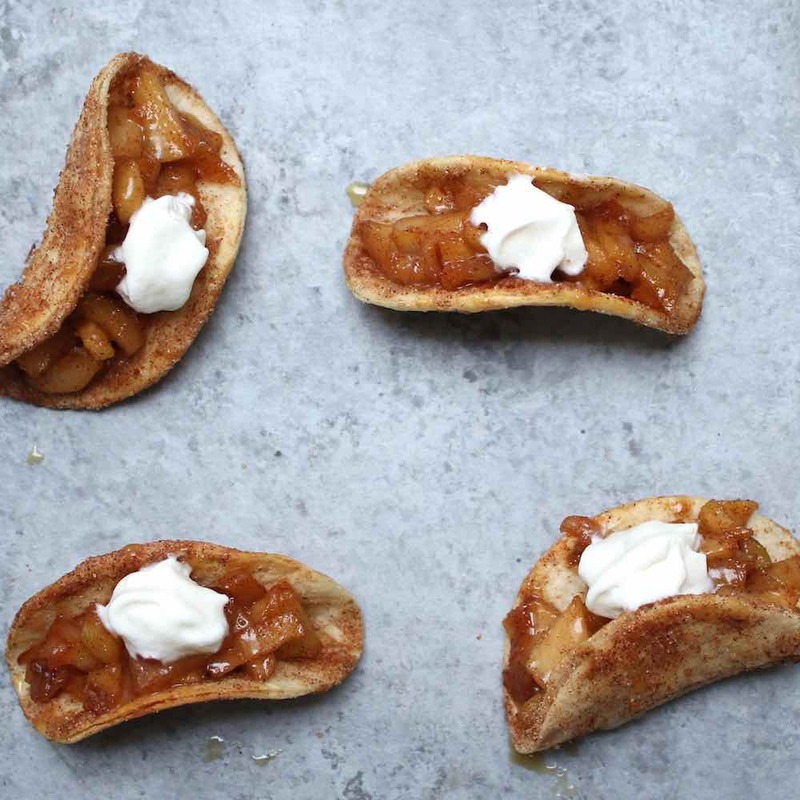 0 Response to "Easy Apple Pie Tacos"